The Annual Tribute: Raise funds, United People, and Inspire Change. If you know you can’t attend and want to support the work we do, please consider a donation to the Tribute. What is the Annual Tribute? 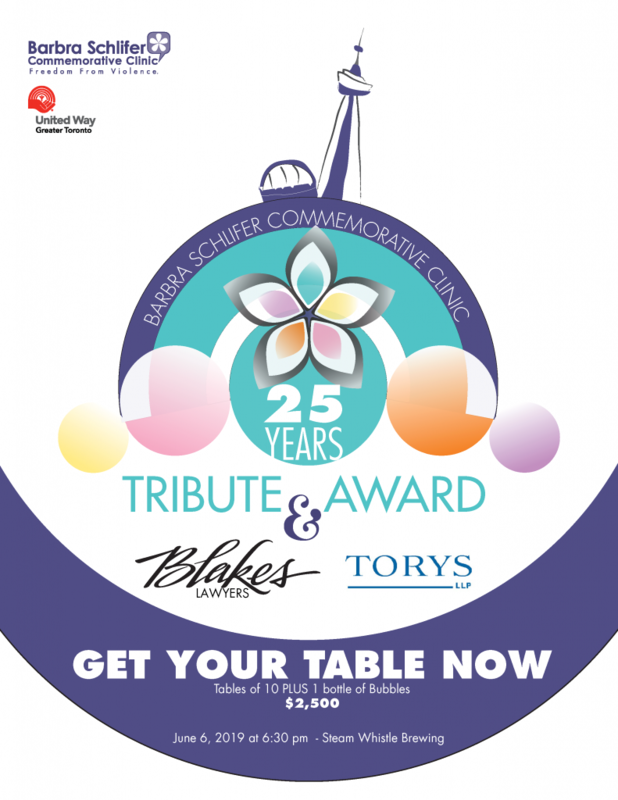 Hosted by Blakes, the Annual Tribute is a truly inspiring evening that brings together an influential and diverse collection of people determined to inspire change. The Annual Tribute represents many things: the coming together of a tight-knit community to honour a woman whose life was ended by violence; the incredible commitment of our sponsors, donors and guests who make the evening a triumphant success; the tireless devotion of staff whose work focuses on what Barbra had once dreamed of doing herself; and, the bravery of women whose lives have been interrupted by violence. This year marks our 25th Anniversary. We hope you will join us! Curious why this fundraising event is so important? Over the past two years, the demand for the Clinic’s services has increased by nearly 92 percent from 4,700 women in 2017 to approximately 9,000 in 2019. Without support from those who believe the work we do is critical, we simply cannot meet the demand. We hope you will join us and help us to celebrate 25 spectacular years! Hanna's story of courage, strength and determination.